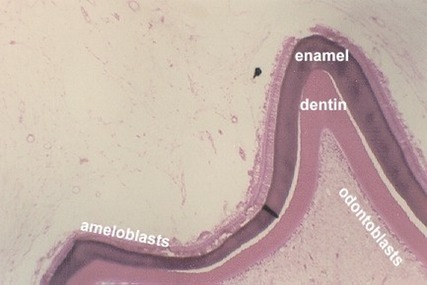 Developing tooth | Microanatomy Web Atlas | Gwen V. Childs, Ph.D.
Look at a slide of the Developing Jaw. Find the version of the slide that has the early developing teeth. This is the coronal section through the lower half of the head of a 120 mm fetus. It shows the nasal septum, a lower nasal concha, a portion of the developing maxilla and mandible, and the tongue. In most slides, the chin is on the right side of the section if the slide label is on your left. Also, your book has diagrams that you can follow as you study these sections. This photo illustrates the earliest extension of the epithelium, called a tooth bud. The epithelia will continue to proliferate and form a process, shown in the following photograph. Tooth bud forming process, extending in from Dental lamina. The above photograph shows continued lengthening of the process. 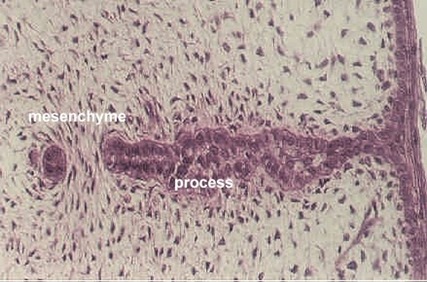 Note that mesenchyme has begun to condense around the base, which is partly out of the plane of the section. In this photograph, the base has begun to expand by the proliferation of the cells along the inner edge. The process becomes flattened at its end and forms the ENAMEL ORGAN. The expansion of the Enamel organ is also shown in the above view. 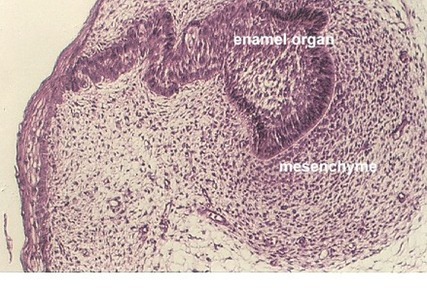 Note the condensed mesenchyme around the organ. 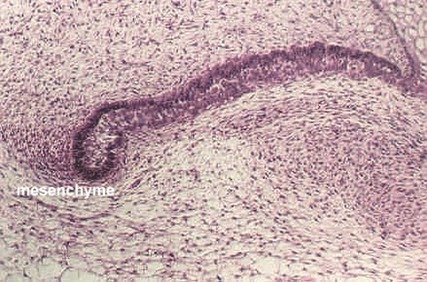 Eventually, the enamel organ epithelia will invaginate and enclose this mesenchyme. This region will become the tooth pulp. The Enamel organ has continued to expand by the proliferation of its epithelium and the base continues to broaden. It has begun to invaginate at one end, enclosing the condensed mesenchyme. This is the beginning of the cap stage. See diagrams in your texts. The area of enclosed mesenchyme is called the DENTAL PAPILLA. Your slide 23 may have an example of a later stage which looks more like a bell. Look for different stages as you study your slide. 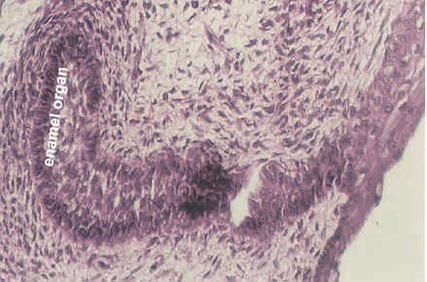 The cuboidal cells on the upper part of the bell or cap are called the OUTER or EXTERNAL dental epithelium (also called enamel epithelium). The more columnar cells lining the concave surface of the bell or cap are called the INNER or INTERNAL dental or enamel epithelium. These will become the layer of AMELOBLASTS which deposit enamel. 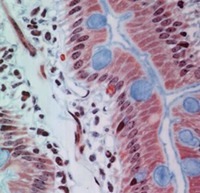 In this photograph, the columnar cells to the right (forming the base of the enamel organ, are the Inner enamel epithelium (labeled inner). 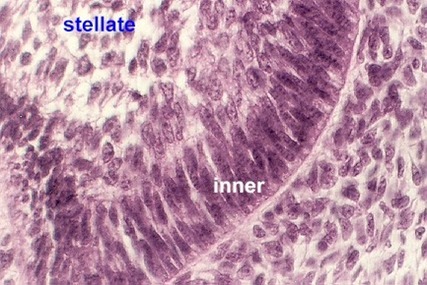 The cells lining the top of the bell (and continuous with the process) are called the outer enamel epithelium (outer). Cells in the center which have lots of spaces between them are called the STELLATE RETICULUM (stellate). 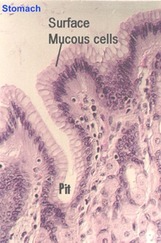 This higher magnification shows the inner enamel epithelium. 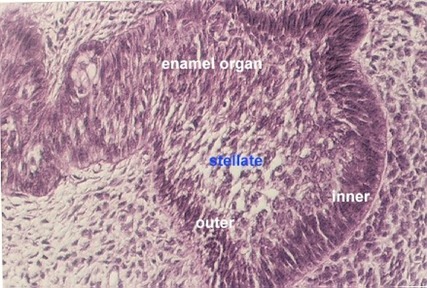 In the upper left region, a portion of the stellate reticulum is also seen. After the enamel organ is formed, the process extending from the oral epithelium will proliferate to form a second tooth bud. Eventually this will become the PERMANENT TOOTH. Try to find a permanent tooth bud in your slide 23. Look at your (or your neighbor's ) slide 23 that shows tooth germs in relatively advanced stages of development. This version of the slide shows only a portion of the developing jaw, which contains one tooth that is more mature. 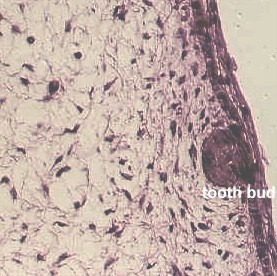 A low power view of the top of this tooth is shown in the above photograph. 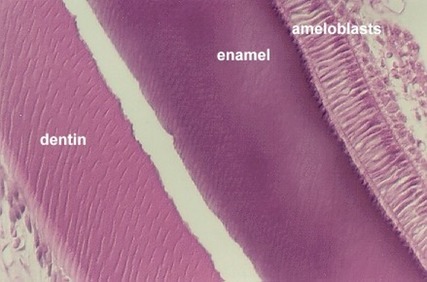 The purple layer is the enamel layer. On top of that layer are the Ameloblasts. The pink layer is the dentin. 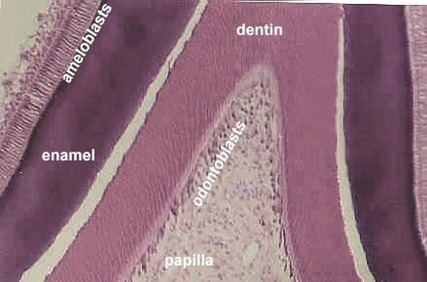 The dentin is laid down by ODONTOBLASTS. They can be seen lined along the INSIDE of the dentin layer. The innermost region is the dental papilla which is the future pulp cavity. Use a low power to find these regions in your slide. A higher magnification shows the same layers. Find ameloblasts, enamel, dentin, odontoblasts and dental papilla on your slides. This high magnification allows you to see the ameloblasts, purple enamel, pink dentin, odontoblasts, and dentinal tubules. 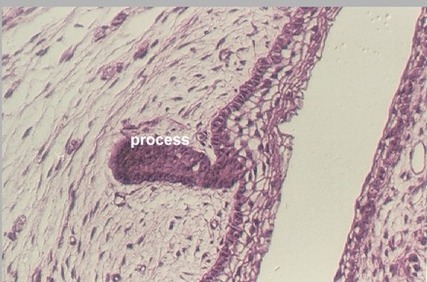 To see the structure of a mature tooth, look at slide 18. The same basic structures illustrated in the above photos can be seen, except for the enamel and the ameloblasts. This section of a decalcified tooth has a missing crown, because the enamel, with its high content of calcium salts and low content of organic material has been completely dissolved during decalcification. 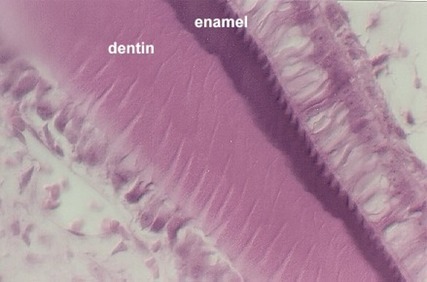 The Dentin can be seen extending beyond the level of the GINGIVAL EPITHELIUM. Find the DENTINAL TUBULES in the dentin, which radiate from the pulp cavity. What is found in the dentinal tubules? Are they anything like canaliculi in bone? Find the PULP CAVITY if you have one in your tooth slide and note the loose connective tissue, blood vessels, nerves and the inner lining of ODONTOBLASTS. Look at the NECK OF THE TOOTH for the CEMENTUM. Cementum is similar to bone, but there are no Haversian systems. The cells in the cementum are called cementocytes. These can best be seen at the bottom of the tooth. In-between the tooth and the actual bone is dense connective tissue called the PERIODONTAL LIGAMENT. It actually looks like a tendon. Its collagenous fibers run from the bone into the cementum. What is the function of the cementocytes?